Who is producing the DVO Garnert post? It's really a rule meant for road racing to keep TT bikes from running a small front wheel to get closer while drafting. Huh that was a surprise for me. Any idea what the argument for that rule was?? I could see the cost aspect, but then a minimum weight rule or even against carbon would make more sense regarding cost.. Interesting to se 29er s catch on in DH. But how about mixed wheelsize bikes (79ers) for DH? In my mind that must be the ultimate to cover all kinds of courses. Stable, grippy, rollover 29" up front. And agile 27" in the rear..
Is there any good arguments against in besides that som cares more about looks then performance? It may look like they do in this photo. But if you enlarge the photo and place a ruler or something along the stanchions you will see it's just an optical illusion due to the edge of the number plate. 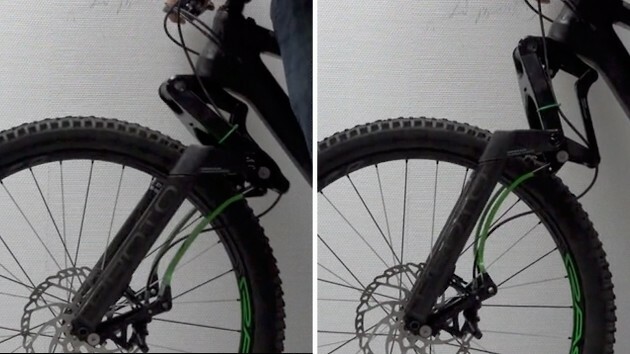 If they would have flexed the fork must suffer to very bad stiction..
You are correct in what it does, and that is easy to understand since the fork is all about lack of brake induced dive. I was struggling to understand WHY it does not dive, and this photo sequence made it clear to me. The specs should be updated with info about the later introduced option of a 160mm 29"
Since the sum (of all dimensions ) does not say anything about Head Angle, Reach or Rear-to-Center, I can't see how it can say much about fit at all. Find the type of bike you want (often defined by HA, RC, material and components) Then you choose the fit/size by Reach. I'm sure I've forgotten something. But wheelbase is to me equally important to the graphic design which I let to the metrosexuals and alike to play with.. This feature has 39 comments. I can agree thread on pinkbike forum was somhow epic. Manly because it's so full of narrow minded bs and theory based picking against what's possibly could be on of the greatest breakthrough in mtb suspension. A bit of both, but mainly to compare different bikes/manufacturers to see how differently they space the Reach measure and how wide the "norm" is..
Is there any list/forum discussion covering Reach numbers on different manufacturer of trail/AM/enduro bikes ? Sorry Woody but it's hard to forgive you for your stupidity when you manage to mix it with such rude and stupid comments! The Missinglink axle path don't cover any "area" since its 1Dimensional. Magic link was 2D. But even my old Kona that got the undampened auxiliary shock have never sendt me OTB since the undampened rebound from the auxiliary shock is so short. It might send a completely stiffened up rider OTB. But no suspension can guarantee to cover rider errors like that. You could take a closer look and read at the Tantrum tech page. Nice update on the website Brian! The new video should make it easier to understand the benefits the Missing link can offer compared to most other suspension patents on the market. Will Tantrum go with the new Boost standard on all frames?